On two nights, Friday April 6 (now sold out), and Saturday April 7, The EST/Sloan Project, as part of the 2018 First Light Festival, will be presenting the first workshop performances of NOBEL: A NEW MUSICAL by Benjamin Weiner, a lively and often moving exploration of the life and loves of Alfred Nobel, inventor of dynamite, philanthropist, and creator of the Nobel Prizes. Playwright/composer Benjamin Weiner kindly took time to answer our many questions about this project. What inspired you to write a musical about Alfred Nobel? In September of 2015, I had just quit my teaching job to focus on writing, and I was terrified. Sitting in the biography room at the Brooklyn Public Library, I stumbled across an article about Bertha Von Suttner. She was briefly Alfred Nobel's housekeeper and secretary in Paris, where they argued about life and death and science. He quickly fell in love with her, but she ran off to elope with a forbidden flame back in Vienna. She became Nobel's lifelong friend, helped reshape his legacy from dynamite to peace, and was the first woman to win the Nobel Peace Prize. Mixed with the excitement about their incredible and theatrical story, there was a fair amount of relief. I didn't feel quite so unemployed, because I knew what I needed to write. Why this musical? Why now? 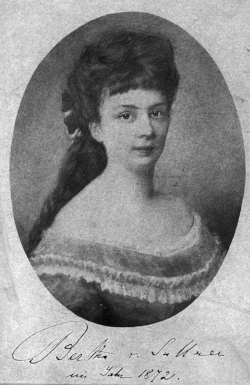 Bertha Kinsky (later von Suttner) in 1872, around the time she first met Nobel. There are so many parallels to today. It features a powerful businessman obsessed with his own image (Nobel), nationalistic countries stockpiling weapons and teetering on the edge of war, and a woman fighting to be recognized in a world dominated by men. In the end, the dominant motivation for me was bringing Bertha's story to life. She was a household name in her time, Tolstoy sang her praises for her pacifist work, she was the first woman to win the Nobel Peace Prize, and NO ONE I have encountered in the past three years has ever heard of her. I am delighted to be changing that. How would you describe the kind of music you feature in NOBEL? The play’s action runs between 1870 and 1905 but the music isn’t really period music. Did you compose all the music? What number and kind of instruments would you like to hear play it? The music is kind of folk rock, with some roots in musical theater tradition, and a handful of references to nineteenth-century opera (though it is by no means period music.) It's all original. I'd love to see violin, cello, piano, drums, guitar, and bass. For this workshop version, I think we'll do nicely with piano and a guitar. Portrait of Alfred Nobel by Emil Osterman. Image provided by the Nobel Foundation. You play with time in the play, switching back and forth between scenes — between Emanuel, Nobel’s nephew and executor of his estate, and Bertha von Suttner, after Alfred has died — and between Alfred and Bertha in their younger years. How did you decide that was the structure that worked best for your story? I've always loved that kind of structure. From Shakespeare starting Romeo and Juliet with a massive spoiler about their deaths, to Andrew Lloyd Webber's chandelier reassembling itself, to Sondheim's Follies or Caryl Churchill's Cloud Nine — there's something really powerful to me about jumping in time, especially starting at the end and showing how you got there. It lets the audience stop worrying about what's going to happen, and lets them focus on the story itself. For a historical piece, where the story is a google away, that felt right. 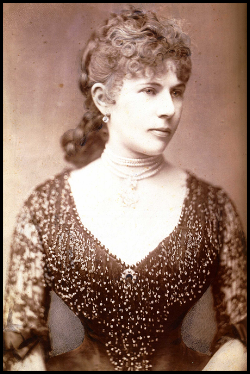 Your play introduces us to the two loves of Nobel’s life, Bertha von Suttner and Sofie Hess — he kept up with both of them for a good part of his life — yet he never married. Any theories about why? Well, Bertha was in love with someone else, and Sophie was twenty years old and mostly interested in Nobel's money. But at the root of it was Nobel's own heart. His journals and letters are filled with insecurity and self-loathing. In the words of RuPaul— "If you can't love yourself, how in the hell you gonna love someone else?" You mention that Bertha won the Nobel Peace Prize herself in 1905, nine years after Nobel’s death. She was only the second woman after Marie Curie to win a Nobel. How solid were her credentials for winning? She completely deserved it — she built groundwork for the UN and the EU before anyone was dreaming about them, and wrote the seminal pacifist book of her time. And she is, arguably, the reason why the prize existed in the first place. But, being a woman, she still had to fight for it. You manage to pack an impressive amount of scientific detail into your lyrics. I expect that “Throw It Down” is the first song with C3H5N3O9 in it. Can you offer tips on how to make science musical? Any chance you’re a fan of Tom Lehrer? Thank you! I think for any musical number, the key question is, “why is this person singing?” And the answer is usually because the moment is too big for spoken words. “Throw It Down” takes place at the bottom of a cliff, where Nobel is defending dynamite and its safety in front of a crowd of Manhattanites by having an assistant throw dynamite down on him. That's a huge moment, and a song packed with the science of his invention feels justified to me. And YES! I love Tom Lehrer. I definitely owe a lot to him. Nobel's letter to Bertha in French from Paris dated January 7, 1893 in which he outlines his idea of establishing a prize for those who made important contributions to the cause of peace in Europe. You include in the play the curious incident where Nobel reads his own obituary prematurely in 1888 when his brother dies and the papers write about the wrong Nobel. “The merchant of death is dead!” the obituary read. “Alfred Nobel, who made his money finding more ways to kill people faster than ever before.” He apparently got so upset about this being his legacy that he then changed his will to devote his wealth to setting up the prizes. Is this a true incident? Might we have no Nobel Prizes if Paris had better reporters? It is real. While I'm more inclined to give Bertha the lion's share of the credit, I do think it was an incredible gift for him, and helped him realize how he would be remembered if he didn't do something about it. What kind of research did you do to write NOBEL? There is a lot of wonderful source material — biographies of Nobel, Bertha's memoirs, her pacifist novel, a lot of letters. There's such a wealth of information, and I was sorely tempted to include it all. Linsay and Graeme really helped me find the story of this musical, and not worry so much about including every historical detail. Maybe I can save some of them for liner notes, someday. We learn in your musical that Nobel fancied himself a writer, writing poems and a play. Have you read any of his works? Any good? Poster from 2005 world premiere of Nemesis, Nobel's play, at Strindbergs Intima Theatre in Stockholm, Sweden. Yeah, they're not great. In fact, to protect his image his estate destroyed almost all the copies of his play. Thankfully it survived, because it's still a fascinating window into who he was, his obsession with death and unrequited love. And I've turned one of his poems, which he showed to Bertha in Paris, into a song. It's about worms eating dead bodies. I think it's really funny, but I don't think Nobel intended it that way. Mostly though, I use his letters, which are wonderful and vivid. He was a great correspondent. Have you written other musicals? What were they about? Pants, Dante's Inferno, Santa Claus, gentrification, Pippi Longstocking, and now Roy Sullivan, a real man who was struck by lightning seven times throughout his life. That one you can see May 11th and 12th at the Jalopy Theatre. Yes. I've been working for a few years as the writer in residence for the Upstream Artists Collective, an incredible group that is making theater about climate change. I wrote a play for them called The Noise. It's a Babylonian flood myth updated for today, and inspired by work I did with first graders after Hurricane Sandy. The goal is to keep our stories theatrical and entertaining and, at the same time, call into question how to live and make theater that is itself sustainable. Usually, it's not. Are you still performing the songs of Princess Backpack? Tell us more about how these came about. Yes! My backpack is a princess who can talk and sing. She comes from Backpackia and is hoping to meet Jay-Z to further her rap career. Together we made a kids album, which you can find at PrincessBackpack.com. It's weirdly popular in Australia. What’s next for Benjamin Weiner? Roy Sullivan: Lightning Man, at the Jalopy Theatre, May 11th and 12th. Then, a long nap. The 2018 EST/Sloan First Light Festival runs from February 5 through April 7 and features readings and workshop productions of eight new plays. The climax of every EST/Sloan season is the annual Mainstage Production, which this year is the world premiere of BUMP by Chiara Atik. Directed by Claudia Weill, BUMP is a wildly entertaining exploration of the history of pregnancy and childbirth, from colonial times until now. Tickets are on sale now for performances, May 9 through June 3. The First Light Festival is made possible through the alliance between The Ensemble Studio Theatre and The Alfred P. Sloan Foundation, now in its twentieth year.